I love these! Homemade lasagna is one of my all-time favorite foods. When I was a kid, we would always have lasagna on Christmas Eve. I hated turkey (still do), and I would eat the leftovers for lunch on Christmas Day. I love to make lasagna, but it seems like a waste since there are just two of us. I saw these cute individual lasagna "cupcakes" on Framed and I immediately added them to our menu. I think they turned out great! They are perfect for small families and great for portion control (this is, if you don't eat 4 or 5 at a time!). For me, this was really just a new method to making lasagana as opposed to a new recipe. I used my Mom's lasagana recipe and just layered it with wontons instead of pasta in the muffin tins. They took a little time to assemble, but it was worth it. These cook in about 20 minutes, which is much better than the hour and a half my big pan of lasagana takes. I was concered about getting them out of the pan, but they popped right out. I just assembled cupcakes until I ran out of cheese and sauce (I got 24 in total). I wrapped the leftovers and threw them in the freezer for a great weeknight meal later!! Spray muffin tin with cooking spray. Place one round wonton wrapper into tin. (I used a mini tart press to press down the edges in the pan). Top wonton with 1 Tbsp meat sauce. Place second wonton ontop of the sauce. Layer 1 Tbsp cottage cheese, 1/3 of mozzarella, 1Tbsp meat sauce, 1/3 parmesan cheese. Top with last wonton and repeat layers. Top with the last piece of mozzarella. Repeat process for as many "cupcakes" as you want. Bake at 375 for 20-25 minutes. Allow to rest for 5 minutes. Run knife around the edge of each "cupcake" and remove from pan. Serve with additional meat sauce. In a medium bowl, mix until egg is thoughly combined. Set aside. My husband hates casseroles and lasgna falls into that category for him. So when I make it, I end up eating some and freezing some for later. I luv the idea of using wonton wrappers. That will make it so much easier to make smaller portions for me! Now I'm in the mood for lasagna! These look really good. What a great idea! I'll be making these soon. Even though I have 2 kids, it still seems like they never eat anything I make. It ends up being just my husband and me trying to finish off a big pan of lasagna. Thanks for sharing! Brilliant! I love having single serving things in the freezer for yoga nights. Adorable. Because let's face it, what isn't better as a cupcake. That definitely includes lasagna! What a great creative idea! I'm your new follower, found your blog and I think that you have a fantastic site! Will be back to read your other posts. Have a lovely day! 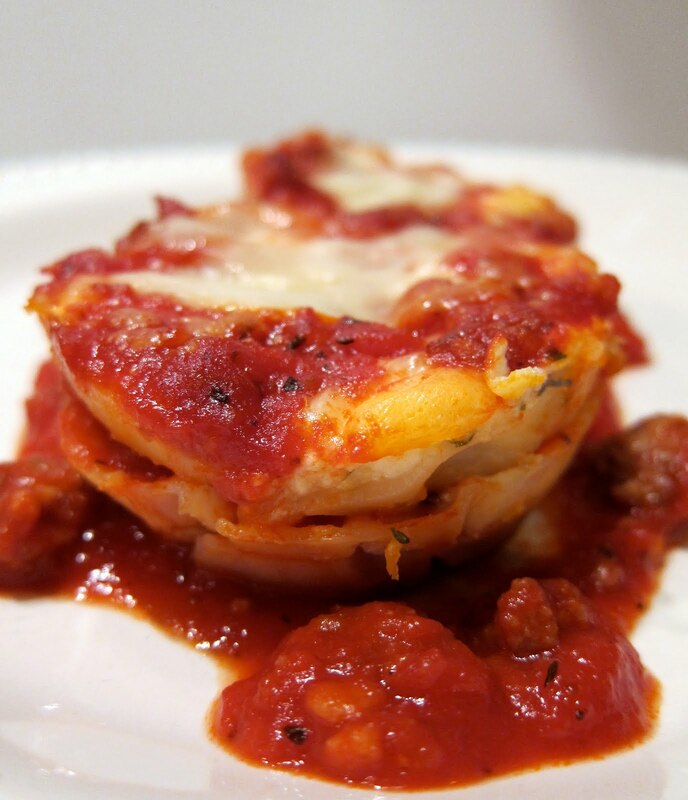 A lasagna cupcake! I just love that idea and I'm definitely going to try this one very soon. I think husband and SD will love it too. Fabulous idea! Now I'm going to be craving lasagna. Those are great! Perfect for dinner or appetizers. 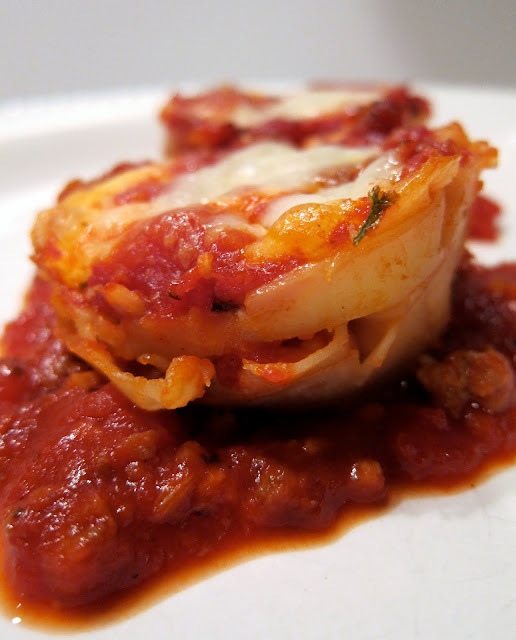 I know I'd like these since I like those lasagna roll ups that are similar. These look good. Hope you gave credit to Aarti from Food Network, because she did this recipe on her show months ago. It was repeated this morning. First time I have checked out your site, but seems you copy a lot of other recipes? ?